Anoola D146 silver jacquard pleated bardot collar dress. Features silver jacquard fabric with midi hem, 3/4 sleeve, back concealed zip and back skirt pleat. Bardot pleated collar with pearl embellished ornamental feature to the left and beaded detailing at end of the sleeves. 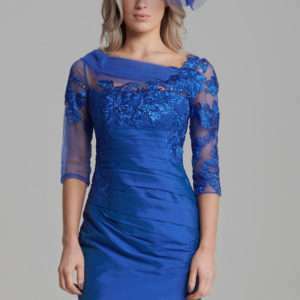 Mother of the Bride or Groom dress. Miss Blush blue floral embroidered applique plunge v front full skirt formal dress. Features floral applique embroidery on the bust sheer straps and skirt of the dress. A plunge v neckline with bust cups and low v back. Full skirt with back concealed zip and silver diamante, crystal and sequin waist band. Miss Blush pale pink cross back sequin beaded choker formal dress. Features pale pink fabric in simple fit and flare shape with high neckline and beaded sequin choker. Stunning beaded sequin back finishes off this feminine formal dress to wear at your next prom, debs or black tie event. Forever Unique Gaia black ruffle drop waist hi low dress. Features ruffle studded detail on top and dropped waist. Ruffle layered hi low hem and ruffle top and back detail. Fine straps with v neckline and concealed back zip.